The district known as "The Phlegreian Fields" is an area which has always been the subject of different legends, going back to the time when the greek settlers arrived in this wonderful land and continuing during the roman time. It is a huge area which became one of the destinations of the Gran Tour and it extends between the Posillipo Hill and the ancient town of Cuma. 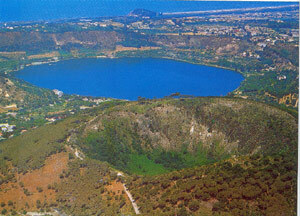 Its major centres are Agnano, Baia, Bacoli, Cuma, Miseno and Pozzuoli. It's an active volcanic area where numerous geysers and sulphurous vapours are still coming out of the soil, making it an ideal place for thermal complexes. After visitng the Casina Vanvitelliana in the town of Bacoli, we will visit the ancient thermal baths of Baia and the archaeological museum of the Phlegreian Fields hosted inside the old Baia Castle. We will then head towards Pozzuoli to visit the anphitheatre, the Macellum and the Solfatara.